If you haven’t done so yet, I highly recommend you read M37’s article this week on ProBoxOffice.com accuracy. It confirms a few things I covered in the Fall continued throughout the tumultuous Awards season, most importantly that when the professional forecasters get their movie predictions wrong, it is usually involves an opening weekend. That completely makes sense given how hard it is to judge the effectiveness of marketing campaigns, whether they be through traditional means or through social media, prior to a films release. This week, we have four new films to consider and a strong holdover in the form of “Zootopia”, which opened more like a Pixar film than a traditional Disney Animation offering. For what it’s worth, the last two Pixar films to open in the $70M range like “Zootopia” did last week were “The Incredibles” in 2004 and “Finding Nemo” in 2003. The former dropped by 28.7% in its second weekend while the latter dropped 33.7%. Regardless of where in that range “Zootopia” falls, it is sure to be in consideration this week. With no forecast from ShowBuzzDaily as of publishing time, the professional forecasts is just from ProBoxOffice.com are shown above. The Value column divides the Average by the FB$. The Use column applies the average of the Value column to non-forecasted films based on their FB$ and is the full list of what I use in my model. The PPP Showtimes column is data, courtesy the kind folks at Gracenote who let me use their showtimes API, from the Phil’s Phun Plicks Chatter post on showtimes in his metro area. I like that number because it is often more revealing than theater counts since the latter doesn’t tell you how often a particular theater might be showing a movie. Given M37’s findings, I added week of release to the table this week. That math generates a list of Best Performer (BP) candidates that includes “The Perfect Match”, “Kung Fu Panda 3”, “Deadpool”, and “Risen”. “Zootopia” should lead most line ups this week and is expected to have another strong showing. What will be tricky this week is to select low end fillers. With all due respect to new FML columnist and colleague Todd Thatcher, I’m not all that high on “The Young Messiah”. While it is true that religious films, oddly enough, have the same dedicated following that horror films do, in this specific instance “The Young Messiah” hast two things working against it. First, it has competition that films like “War Room” didn’t have in the form of “Risen”. Second, it has a low theater count at 1,750. Now while I typically don’t use theater counts as a strict indicator of performance, history shows us what a realistic upper limit might be. In August of 2011, “The Debt” got up to $12.8M on 1,858 theaters, but was a remake released in the summer with marketable stars. A more realistic comparison might be “United 93” which brought in $11.4M at 1,795 theaters in 2006 but also had a marketing advantage tied to fairly recent national events that “The Young Messiah” does not. While it may do better than the $6.7M that ProBoxOffice.com predicts, getting all the way up to $12M is a tall order. 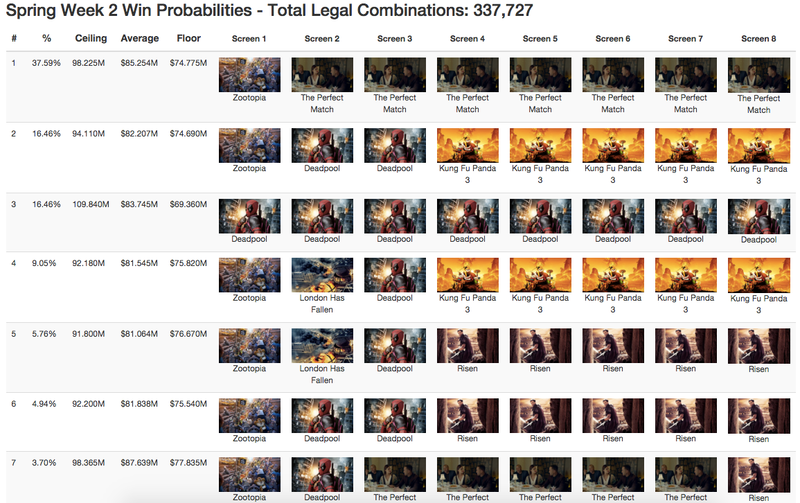 If you believe in it despite these knocks against it, 8x “The Young Messiah” has high risk, high reward and 1x “Deadpool” + 7x “The Young Messiah” slightly less so. Despite a low theater count of 850, I much prefer, as ProBoxOffice.com does, “The Perfect Match”. While that may seem contradictory given the last two paragraphs, as Butter so eloquently posted recently there’s precedent for Tyler Perry movies to do well with low theater counts and this Queen Latifah produced film targeting a similar audience seems to be following a similar roll out. It is notable that on Phil’s showtime count, it is much closer to “The Young Messiah” than the theater count would lead one to believe. Plus, the bar for Best Performer is much lower for “The Perfect Match” given the pricing, hence why my model likes it so much this week and I’ll be playing “Zootopia” + 7x “The Perfect Match” on both of my accounts this week. Finally, if you are looking for something different that doesn’t involve new films, 8x “Deadpool” could work out as well as the super hero flick enters its 5th week, which as M37 pointed out is a point in the life of a movie where the pros have trouble with accurate forecasts. Another metric that may be useful, overall lifetime trend, especially when it comes to those movies that have been out for several weeks because as you and M37 pointed out, weeks after 5 become more difficult to predict. It would be interesting to see the trending decline of a movie’s revenue and use that as a possible prediction for where the decline is headed. We have almost a year’s worth of data, and I would hypothesize that the decline of movies is probably relatively consistent across certain metrics, such as genre/holiday/opening weekend gross. Obviously, there would be exceptions, such as “The Revenant” having an increase of 2.2% in week 10, but those could also be easily explained, such as the Oscars being held that week and a renewed interest in the film. I’m not sure what happened there with the whole Young/Last thing. Thanks for pointing it out 8). OK, fixed here thanks again for pointing it out. I apparently did it on the podcast too 8(. You are correct that we have a lot of decline data and I haven’t yet taken a close look at it, but in theory you could find comps post week 5 by looking for films that matched the decay of weeks 2-4, possibly paying more attention to those that match genre or other factors you point out. I’m working on some tooling to do exactly that, but its in its infancy. More on that in a few months. . .